Join us on Wednesday, January 9, for an epic workshop and lecture by acclaimed magician Gregory Wilson. About the Lecture: "Things I Carry and Use"
Just like the title reveals, this lecture uses things that fit in his pockets and are found around him, ever-ready for spur-of-the-moment astonishments. Continuing on his impromptu work from Off the Cuff and On the Spot, Greg teaches how to convert everyday objects into devastating weapons of deception. The emphasis here is entertainment. Just because it's called a lecture doesn't mean is has to be dry and academic. You'll experience a rip-roaring, laugh out loud, audience-involving show! Beyond cards, there are many normal and natural props that would make MacGyver proud, like coins, phones, watches, rings, toothpicks, and anything in a coffeehouse. The format of the workshop is your choice: Impromptu and/or formal performances; scheduled and/or personal requests. Each attendee will also learn the underlying philosophy and psychology of how and why deception works. All in all, this interactive course of instruction will guarantee that everyone walks away with full and complete routines in their working repertoires. LIMITED TO 10 ATTENDEES! You must sign up ahead of time by sending email to president@ring216.org. No exceptions! December was Stage and Parlor Competition time at Ring 216! In the Standard Division: Alexander Thorn caused a blindfolded spectator to divine a chosen drawing. Suyash Joshi combined technology and magic in several effects. Susan Zeller performed her musical cups and balls. Mitch Kothe showed his ability to balance. And Miriam Al-Sultan found half of a spectator’s bill in a candy bar. In the Masters Division: John Jones caused a spectator’s chosen king to lose his head. Fred Lee excited with billiard ball manipulation and card productions. Tom Collett explained the difference between science and magic as he made red and white knots change places. David Martinez showed that a set of free mental choices by spectators had been predicted before the show. Congratulations to all contestants for a good show! His opening, a “lucky chip” handling, demonstrated how to stun by managing audience memory before it is formed. The spectators will recall one of them looking through the deck and selecting any card, and then another spectator dropping a chip on a face down spread deck and turning over the card it landed on – without the performer touching it. Jon similarly provided tips on the classic force, sandwich card effect, collectors, and the deck-to-block surprise. He ended with an in-depth study of his famous “Tiny Plunger,” including many detailed tips and hints for maximum performance. Before the lecture, the annual elections were briskly held. The officers will be instated in January. Join us on Wednesday, November 14th, for a magic workshop and lecture by Magic Castle Close-Up Magician of the Year Jon Armstrong. At the lecture, Jon will show you a mix of both close-up and stand-up, some with cards others with things like neckties and novelty rings, that are fun to learn and even more fun to do. We know you are going to love watching Jon perform, not only because he is funny, but the magic you will learn is incredible. And in this lecture Jon covers a huge variety of strong magic including: Bottle productions, his ring and tie routine, Tiny Plunger and tons of killer card magic. Including his famous Card Under Watch routine. Plus a few items never seen in a lecture before! The workshop is called “The journey from Close up to Parlour” The two-hour workshop will be about taking close-up magic and making it play larger. It will cover card, coin, and rubber band magic and ways to make it play to groups of up to 100 people. If you do great close-up but have wanted to do something that played for a larger group, at open mic night, a family gathering or show, this is the workshop for you. Winner of numerous awards, including Close Up Magician of the Year, Jon Armstrong has brought his amazing skills and magical comedy to prestigious audiences in over 40 countries worldwide. It's time for some more magic! The 2018 Close-Up Magic Competition is just around the corner — Wednesday, Oct. 10. Come on out to support your fellow magicians as they present their best material in a formal, close-up setting... think Close-Up Room at the Magic Castle (without the cover charge). Close-up is defined as an act presented in a formal performing area with a table. There will be 2-3 rows of seating. But remember that we don't have raked seating, so don't expect people in the 2nd or 3rd row to be able to see the top of the table. All paid members are allowed to compete, including past winners. If you're new to the club, you have to attend at least three meetings this year to become a member. Mark your calendars. Bring your friends. The 2018 Walk-Around Magic Competition is just a few weeks away — Wednesday, Sept. 12. Come on out to support your fellow magicians as they present their best material in a walk-around setting. And since magic is always better when there are more people to enjoy it, bring your friends and family! There's still time to sign up. The room will be set up as if you're at a cocktail party doing walk-around magic. People will be in different types of situations: some standing, some sitting, some with tables, some holding drinks. Your job is to entertain them in a short amount of time under the conditions you have. All paid members are allowed to compete. If you're new to the club, you have to attend at least three meetings this year to become a member. If you've won in the past, you are free to compete, but you have to perform a different act. 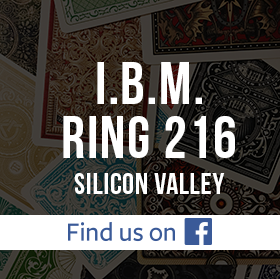 An open performance night with a twist highlighted the August meeting of Ring 216. On this night, the volunteer performers were separated into three small groups which visited in turn audience members at three separate tables. This gave more performing opportunities and a more intimate setting, with the opportunity for instant give-and-take sessions on each performance. In Group 1, John Jay performed a coins across, Tom Collett jumping knots with red and white silks, Sohum Modha an amazing matching of cards randomly stopped at, and Don White his lucky coin that multiplied into poker chips. The Group 2 illusions included new member Vickie Jasinsky’s location of one selected card out of twenty-one, Mitch Kothe’s ESP cards prediction, Tetra’s magic finger ring routine and unique three-gear flight. For Group 3, Cal Tong work-shopped his new copper-silver-brass coin routine, Ken King transported a selected card from a padlocked deck, and Fred Lee showed off a four-coin routine. The evening closed with the reassembling of the audience for a reprise of some of the performances before the entire group. The new performing format was found by all to be refreshing and a fine aid in developing performing skills. Past Ring 216 president Cal Tong will lead members in a teaching session about basic coin sleights. The specific sleights will depend on what the attendees need help with. This is a great opportunity to learn from a master of coin magic. Normally, the Walk-Around Competition is held in August, but this year, many members will be at Magic Live. So the regular meeting will be hosted by our treasurer John Jones and vice president Tom Collett and feature a something a little different. Attendees will be divided into groups of 3-4, and then everybody will have the opportunity to perform a short trick, sleight, or script in order to receive constructive feedback from the group. This is the perfect way to get help and ideas from your fellow magicians in a low-stress environment. For whatever time remaining, attendees will be invited to share something with the rest of the group. It can be an open performance routine, a product review, or something else that they want the group to know about. We hope you've been working on your acts for our Walk-Around Competition on September 12, 2018. We're taking signups now. Just click the big signup button below to let us know you want to compete. This is a great, low-stress way to hone your act and get feedback. Remember: The goal is to do your best and not focus on winning. Just have fun! Acts should be around 6 minutes long, so start timing yourself. Just a month after the Walk-Around Competition, we'll host the Close-Up Magic Competition. Start preparing your act! Ring 216 will host a lecture and workshop from Jon Armstrong, previous winner of Close-Up Magician of the Year from the Magic Castle. More information to come! If you're interested in joining the leadership team of Ring 216 for next year, please get in touch with Fred Rasmussen and Cal Tong, who head up our nominating committee. Send email to both of them at nominating-committee@ring216.org. The officers are thinking of hosting beginner's workshops and will start reaching out for ideas. If you have any ideas or requests, please share them with an officer. “That was the best lecture ever!” The immediate response on Ring 216 social media was unabashed praise for the presentation by David Gerard. The Bay Area magician and long-time friend of the Ring had devised his lecture to answer the questions he had been most asked by the members: How to develop entertaining presentations? How to succeed at marketing and producing a show? Few suspected that his talk on the practical business of magic would turn out to be as lively and funny as his magic performances. Being entertaining is not one secret, David said, but a combination of hundreds of small factors. When he started out eight years ago, what he cared about most was to perform one effect in a local magic show; his goals grew every year as he felt he could always find ways to get bigger applause. Now he had eight hundred professional performances behind him and this lecture consolidated his lessons learned – implicitly, it seemed, in preparation for his next phase of development. The two-and-a-half hour lecture was overwhelmingly generous in its range of subjects, from strolling at company parties to managing a mentalism show. There was an abundance of anecdotes, from the trials of performing for CEOs at private dinners to the chastisement received when attempting to perform for an unappreciative clique at a party. There was a flood of practical advice, from the use of video to judge spectator interaction to how to stage the visual texture of your presentations. David discussed the five effects he used for all situations and did a deep dive into one card routine, covering the fine points of how it made use of misdirection in a strolling environment, with an ending that probably fooled most of the magicians at the lecture. For many, the highlight of the lecture was David’s explanation of his characteristic back-and-forth banter with his audiences. He described how he achieved this through a mixture of planned branched responses and spontaneous risk taking, and art he illustrated with numerous stories from his shows. Ring 216 members and friends: Join us on July 11 at 7:30 p.m. sharp for a magic lecture by the Bay Area's foremost purveyor of sleek, smart, modern magic: David Gerard. After looking over the survey feedback from Ring 216 members, David has crafted a custom lecture for our group that dives into what everyone asked for — presentation, how to market yourself, and how to make your show more entertaining. Leveraging real life examples from his busy corporate and private show schedule, David will bring concepts to life in a way rarely seen by magic lecturers. David will hold nothing back in the lecture, offering up the ways he built his business in the Bay Area over the last 8 years. He'll also offer up stories and advice from touring with The Illusionists, how he got in the SF Chronicle, and how he built gerardmagic.com to service his key buyers. There is something for everyone in this lecture, and we can't wait to host David in just a two short weeks. No need to RSVP... just show up! At the June meeting, Ring 216 held its annual Flea Market and Auction. The members browsed among the collectible-crammed tables hunting for bargain miracles. Many of the amazing wonders that did not sell at the flea market were offered at the auction that followed, a lively affair in which each seller acted as his own auctioneer. Doug Eakin presented a bundle of classics such as Glorpy and, after spirited bidding, sold the whole lot for a happy price. He followed this up with a box of books, the some rice bowls and chocolate. Phil Ackerly offered a number of trick/DVD combinations, a handmade mirror glass, and – his biggest item – a wireless microphone system with case. Will Chandler, known for his role as auctioneer in previous years, gave a sample of his high energy spiel with a series of custom bundles designed just for this occasion: the Champagne Bucket Full of Magic, the Magic Hat Full of Magic, and the Matt King Signed Lunchbox of Magic. Dan Chan had some useful items, and Fred Lee and Mitch Kothe found buyers for some newer mentalism effects. Danny Cheng concentrated on close up items, including a set of small linking rings. Stan Sieler is owed special thanks for donating the proceeds of his comedy mentalism sale to the Ring. Flea market sellers who did not also auction items included David Martinez, Jim Blaishek and Cal Tong, Don White with his crowd-funded Chinese coins, and the irrepressible book collector and dealer Byron Walker. Got magic stuff you want to get rid of? Is there anything you have your eye on? Bring your magical friends and join us at our next meeting on Wednesday, June 13, beginning at 7:00 PM to shop the collections of your fellow magicians — and/or sell the stuff you don't use anymore. You can view a layout of the tables when you reserve, and you can make a request for a particular table (although requests are not guaranteed). The earlier you reserve, the more likely you will be to get your preferred location. 8:15 PM: The auction begins. It was the busiest Ring 216 night of the year in terms of scheduled magical events. It all started with music. Musician, composer and kid show magician Pete Appel walked out for his mini-lecture to some rousing opening music – then left and walked out again without the music. He asked, see the difference? He drew on his experiences to demonstrate the effectiveness of music in magical performances. “Music can transport people to another place or time,” he pointed out. Music can be used to change emotion, or to attract attention, or as a mnemonic device – one must select music to match your intentions. He covered many practical aspects about using music at the performance site, such as carrying converter plugs and how to work with the sound guy. Stepping in to provide his own experience, well-known and very busy area magician Phil Ackerly emphasized that music takes your show to a whole different level – it makes the show more exciting. Phil gave tips on where to obtain royalty-free music. And if you have no music, use your voice – da da da! This lecture alone could have filled the entire night, but there was more. Two teach-in workshops followed, with Calvin Tong teaching fine points of a particular coin sleight, and Gary Goldberg leading a discussion on a particular card sleight (names of sleights withheld from this public web site). Peter Apel will facilitate a group discussion on the topic, “The Magic of Audio: How Thoughtful Selection and Use of Music Can Enhance Your Magical Performance.” He'll cover selecting the right music, preparation and practice, technology and hardware, and other topics brought up by the members. Next, we'll divide attendees into two groups to take part in teach-in sessions led by two Ring 216 officers. Each group will have the opportunity to attend each session. • Cal Tong will lead a session on false transfers. As student of Shoot Ogawa, Cal is a master of the art and will discuss technique, psychology, and misdirection. Bring your own coins or other small objects to practice with. • Gary Goldberg will facilitate a discussion on the double-lift. Gary is a wonderful cardician who has studied the classics, and he'll be able to share advice and techniques for mastering this extremely valuable card sleight. Have you bought any new magic books, videos, or tricks lately? Tell us what you think about them! We're going to inaugurate a new feature of Ring 216 where we invite YOU to share your opinions in an open forum about what you've purchased. In 1-3 minutes, tell us what you like or don't like about it so that your fellow members can decide whether to buy it. If you haven't performed at the Ring lately, we invite you to show your stuff! You'll get first priority during our open performance portion of the evening. Remember: As a member of Ring 216, you're obligated to perform at a club event (meeting or competition) at least once per year. Nervous? No need to be... We're family! Before the scheduled start of the April meeting of Ring 216, Don White led a workshop to practice the pen and cap trick that had been taught in the previous month’s Michael Feldman lecture. The meeting proper began with a greeting to new visitors and a free-for-members raffle of some generously donated magical items. It was Open Performance Night and a variety of valiant volunteers stepped up to practice and baffle. Rafael Delgadillo started things off by divining a chosen card while his back was turned. John Jones performed a 3-fly routine with differently colored poker chips. John Mosh caused a spectator’s imagined red-backed card to materialize reversed in a blue deck, and he took care to show both sides of the deck. Grant Yang, in his first performance for the Ring, performed a series of intertwined card mysteries, as a single selection is found three different ways. Mitch Kothe used a spectator’s password to find a selected card, then the whole audience participated with cards in hand to find their own cards with their passwords. Fred Rasmussen pitted a man and a woman against each other in trying to guess the color of a series of cards; the man was always wrong and the woman was always right. Ken King told a history-based Old West tale where a gambler cut to four kings – which subsequently changed to four deuces. Don White performed an inventive and deceptive close-up Miser’s Dream - the endless production of coins -- which he then taught to all. David Martinez and a spectator took turns playing detective to identify the culprit among a group of spectators who held the guilty envelope. Tom Collett closed out the evening with his presentation of a transforming sponge ball. Ring 216 members and friends: Join your friends in magic on April 11, 2018, at 7:30 p.m. for our next regular meeting. We'll practice one of the routines we learned at Michael Feldman's lecture: End for End. David has purchased a collection of Pilot V7 pens, and so we'll have them available to use and purchase (only $3 for two pens, red and black). The routine is available in Michael's book "The Opposite of People," and you can also purchase a video download of the routine from Art of Magic. As usual, Ring 216 members are eligible to participate in a raffle of magic items — books, tricks, and videos — donated by our members. If you have anything you'd like to share with other members, please bring it! After the raffle, we'll have a regular night of open performances. Perform a routine you're working on and get feedback. Or if you have something you'd like to teach us or ideas you'd like to share, bring those, too. Did anyone say refreshments? We'll have those, too. Feel free to bring some food to share if you'd like. The creative Bay Area magician Michael Feldman presented a lecture on his latest material to a large audience of Ring 216 members. The first edition of his recent book, A New Angle, co-written with Ryan Plunkett, has nearly sold out. The last remaining copies were offered for sale after the lecture, and quickly snapped up. Michael performed and explained a series of novel effects. He began by holding a competition to find the three best Rock Paper Scissors players in the room. The winning moves of the top three players then turned out to have been written, in the correct order, on three large sheets of paper that had been stuck to the wall since the start of the game. The material from his new book was then showcased in a series of card routines, kicked off by Ryan Plunkett’s “Shuffleupagus.” Two spectators each shuffle half the deck. The magician then shuffles and shows the cards are nearly separated into reds and blacks. He shuffles again, and the cards are in new deck order. It was this effect which was the genesis of the book, Michael explained. He followed this up with the outstanding “Complete faro control, then the direct location of any named four of a kind, and rounded off with some thinking on the larger principles behind the book. The second half of the lecture was devoted to impromptu card tricks. These included an in-the-hands effect where a mixed deck of face-up and face-down cards rights itself and a cutting the aces routine. The finale was “Merely Impossible,” a routine Michael has been incorporating into his act over the past year. This astonishing routine has taken in probably every magician who has seen it. In essence, the selected and signed card is located by the magician in the deck…before the spectator returns it to the deck! Michael graciously discussed in detail the psychology behind the routine. The books he brought with him quickly sold out at the end of the lecture – but a new edition is on the way. Join us on March 14 at 7:30 p.m. sharp for a magic lecture by San Francisco's own Michael Feldman — sleight-of-hand artist and international man of mystery. As a gift for Ring 216 members, Michael's lecture is free for paid members ($20 for non-members). You can sign up for membership at the meeting and enjoy all the benefits for just $25. For the last 20 years, Michael has traveled the world with a deck of cards performing sleight-of-hand magic. He has been a featured performer at the Magic Castle in Hollywood, on Crystal Cruiselines, and at Monday Night Magic, New York’s longest-running, off-Broadway magic show. At the lecture, Michael is planning to cover a variety of topics. He's most excited about (1) a stand up routine that can be customized to predict almost anything, (2) performing with signed cards, and (3) hands-off magic with cards. In addition, he's interested to hear what people want to see or have him talk about. He can tailor the lecture to discuss what people would like to hear. The magicians lingered talking with John Carney long after the appointed time for the center to close. At the front desk, Cheryl, waiting patiently, said she did not mind. It looked to her like it had been an important night for the magicians. Awards – raffle prizes – a mini-lecture – and magic performances. What more could one want for Valentine’s Day? First on the agenda, the awards were handed out for the Ring’s magic competitions that took place last year. Beautiful first-place trophies were awarded to Alex Wu (Stage/Parlor) and to Danny Cheng (Walk-Around,Close-Up and Magician of the Year). Personalized certificates were awarded to the People’s Choice winners, Tom Collett (Stage/Parlor), Perry Yan (Walk-Around) and Luke Adams and Danny Cheng (Close-Up). The free-for-members raffle followed with prizes of magic props and DVDs generously donated to the club by Fred Rasmussen, John Jones, David Martinez and Tom Collett. David Martinez presented a mini-lecture on “Opening Lines.” Quoting Eugene Burger – “Every good trick deserves a good opening line” – David compared the compelling first lines of literary works to the typical opener of magicians: “Here I have an ordinary deck of cards.” David presented the characteristics of great lines and how to find them, with references to the ideas of Darwin Ortiz and Pete McCabe. At the end he handed out lecture notes with dozens of examples of openers. In the open performances of the evening, in which feedback was provided by the members if the performer requested, the Ring enjoyed the following acts. Anthony “Doc Boodle” Pratkanis – The Three Shell Game. Gene Johnson – Four aces fairly lost in the deck rise to the top. Danny Cheng – Coins fly from hand to hand. Mitch Kothe – A new arrival to the Ring, presenting Valentine themed three card location with a color change, and the deck turning into a steel block. John Jones – The Box of Doom card prediction. David Martinez – Teleportation of a nickel from hand to hand as spectators held his wrists. Ken King – The Wizard Clock prediction. Raphael Delgadillo – Card magic. Tom Collett – Vanishing ribbon. Gary Goldberg – A Shuffling Lesson. Stan Sieler – A divination.